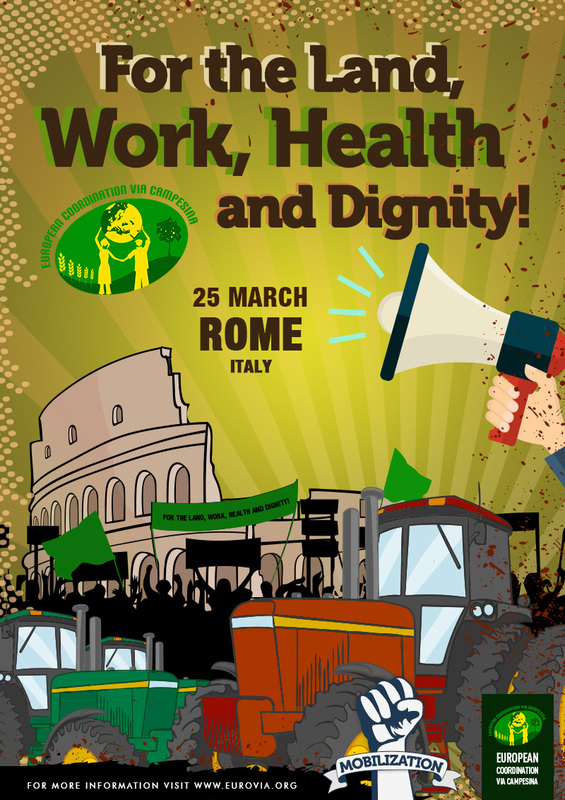 We call on ECVC’s member organizations, allied groups, grassroots networks, and the whole peasant and food sovereignty movement in Europe to mobilize this 25 March – on the 60th anniversary of the Treaty of Rome – for another Europe, for one that cares for its population and not that protects corporate interests, for an agricultural policy that provides quality food, decent income for producers, decent work and protects the environment. The objectives promised by the Treaty of Rome and the Common Agricultural Policy (CAP) have been kicked down the road for the last decades. Instead we have witnessed the implementation of a series of measures by European institutions that have only benefited a trade agenda controlled by big corporate interests. Despite being mentioned in the 1957 founding agreement, major objectives such as ensuring a just and dignified life for the agricultural population, stabilizing markets, and ensuring Europe’s food supply at prices that are accessible to all consumers, have been largely ignored in the agricultural policies of the last sixty years. 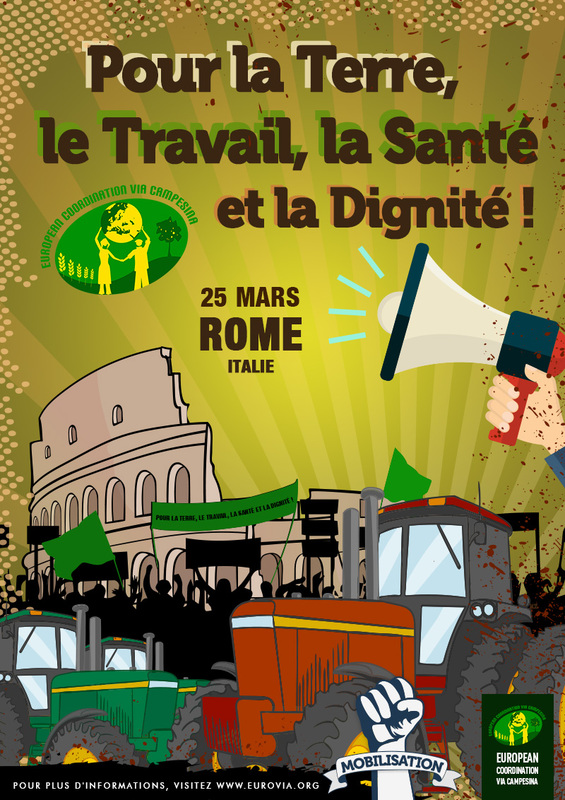 Considering the still outstanding debt to the peasant world, the rural regions of the European Union, and the rest of the European population, ECVC along with a vast coalition of civil society organizations – alliances resulting from the outstanding work carried out by our Italian member and host of this meeting, ARI (Associazione Rurale Italiana) – will carry out a series of actions to recover the initial food security objectives of this agreement, and, at the same time, to reject its productivist dimension, currently obsolete. Instead, we want the consolidation of a vision adapted to the current challenges of our society, in terms of public health, the environment and social justice. A more detailed program for this day of actions will be shared shortly. Our key points for a new CAP can be found here. All together this 25 MARCH for a CAP that serves the Peoples! 60 years of destructive policies is enough! For the Land, work, health and dignity!